April is upon us and I'm set to turn 22 on the 15th (I know, what a coincidence that I was born on the day that is typically Tax Day in the US and that I enjoy personal finance). The NBA Playoffs are set to begin in just a few days, with my Milwaukee Bucks looking like a legitimate contender in the East. With that said, it's time to examine our dividend income for March. We received a total of $57.53 between our Robinhood account, our retirement account, and our M1 Finance account. This represents a total YOY growth of 192.5% compared to the $19.67 collected in March 2018. We also had a QOQ growth of 6.9% compared to the $53.84 in dividends collected in December 2018, although as we'll discuss later this growth is a bit inflated because of an additional payer in March. The $57.53 received in March represents yet another personal best in dividends collected to date. Of the $57.53, a total of $33.51 originated from our Robinhood account, with 13 companies paying me during the month of March. This is compared to the $29.85 collected in December from 12 companies. We'll discuss the math behind the $3.66 increase from December 2018 to March. 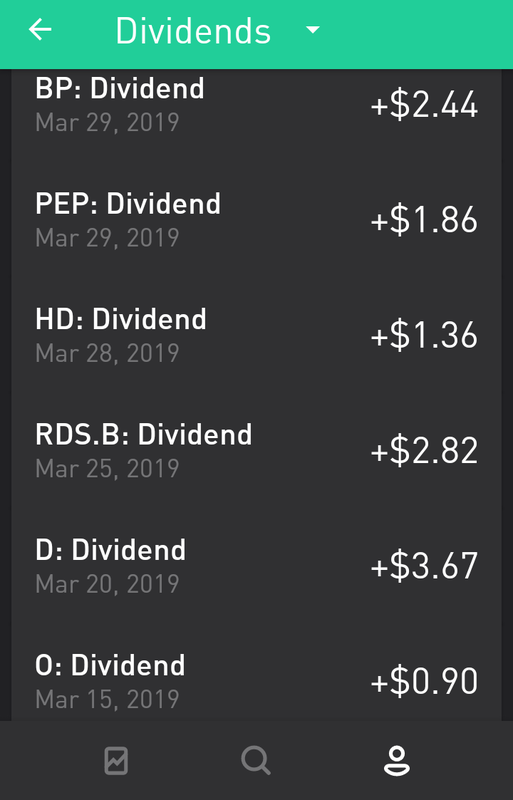 I received $1.86 in dividends from Pepsico (PEP) in March compared to no dividend in December (due to it being paid in January). I benefited from a dividend raise from Dominion Energy (D) and was paid dividends for an additional share of D as I reduced a position in my portfolio to add to D and AbbVie (ABBV), which is a subject I'll discuss in a few weeks. 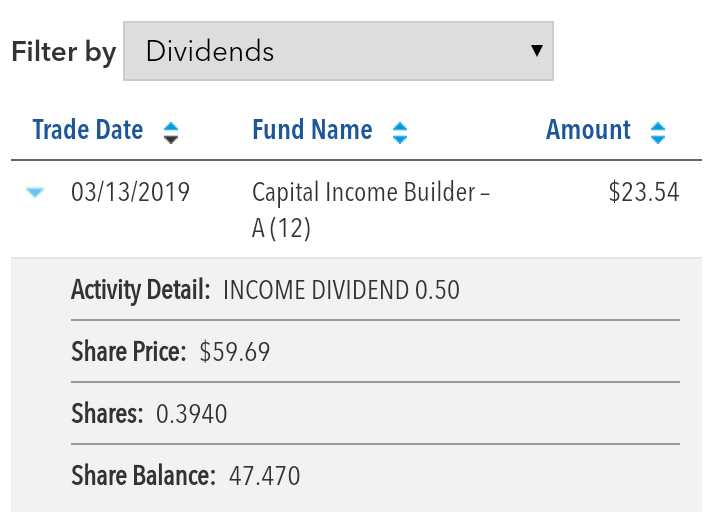 This resulted in a $1.16 increase in dividends collected from D.
I also benefited from another dividend raise from Realty Income (O) to the tune of $0.02. While on the subject of dividend increases, I also received a massive dividend raise from The Home Depot (HD), which helped increase my dividends from HD by $0.33. Yet another dividend increase that increased dividend income was the raise from Amgen (AMGN) which increased dividends by $0.13. The last activity pertaining to the Robinhood account was the raise from Pfizer (PFE) that increased my dividends collected by $0.16. 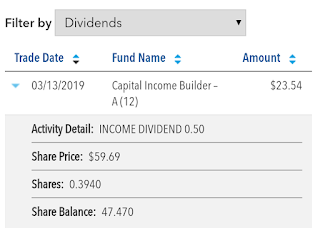 Moving on to the retirement account through my employer, I received $23.54 in dividends from my mutual fund holding CAIBX compared to the $23.55 in dividends from December, when including the $5.15 special dividend. Finally, the M1 Finance account provided $0.48 in dividends compared to the $0.44 in December. 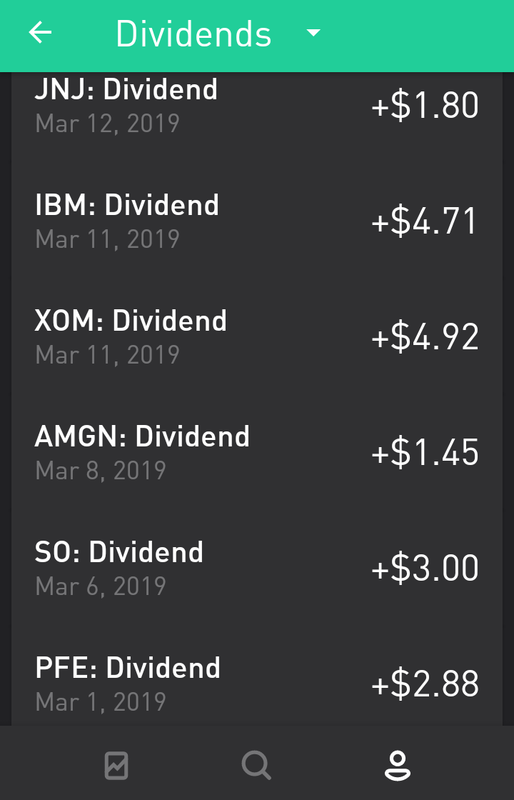 March was yet another record month in dividends collected for me. I continue to inch closer to the $100 month mark, although that likely won't happen until early next year. 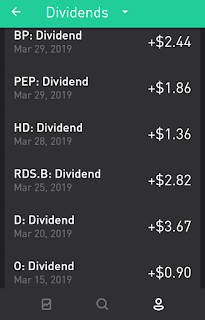 Even when we factor out the Pepsi dividend and the additional share of Dominion that resulted in higher income for March and will result in lower income in May for the position I partially sold a few weeks back, we still arrive at close to $55 in dividends. Although this is very little growth, any growth is welcomed while I finish out the last 4 months of undergrad and continue to focus on paying tuition, in addition to paying for a car in cash later this year, as per my 2019 goals. 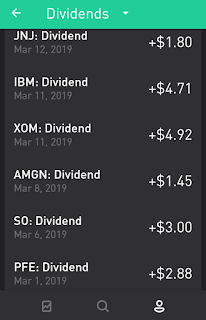 What was your dividend income for March? What was your YOY and QOQ growth? As always, thanks for reading and I look forward to replying to your comments. HECK yah, you are right on the mark and track to be in an incredible position. Keep it up. You two absolutely crushed it last month! It's always inspiring to check out your progress and know that those results are only a few years down the line for me. Thanks for that extra motivation!